Can Dogs Eat Candy Corn or are its ingredients really dangerous? Can Dogs Eat Candy Corn? 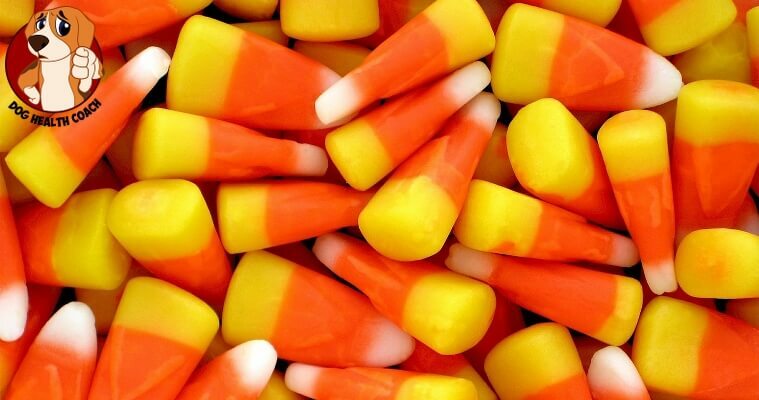 Candy corn is a tasty, sweet treat many of us associate with Halloween and Thanksgiving (also sometimes known as Indian corn). It’s a small confection that is so easily-poppable, we can’t seem to get enough of it in the autumn season. But, most candies are dangerous for dogs, so where does candy corn fall on that list? Well, dogs should probably stay away from candy corn altogether, for health reasons. Artificial ingredients, and high sugar content are bad for dogs! Most people automatically consider chocolate candy as something that’s ‘bad’ for dogs, but don’t take many other candies into consideration, when they can be just as harmful. Candy corn is essentially made up of sugar (even worse would be Xylitol), and artificial ingredients that can be harmful to dogs if ingested, especially in high quantities. Corn syrup, carnauba wax, artificial coloring, and binders are some of the main ingredients in candy corn, all of which can cause issues for your dog. The artificial ingredients and colors can cause digestive issues, and diarrhea, which can lead to dehydration. The sugar itself can also lead to dehydration, soaking up water from your dog’s colon and causing diarrhea as well. You may just think your dog is experiencing an upset stomach, but candy corn can cause problems far more serious. In general, candy is never a good idea for dogs – it’s very rarely ‘natural,’ and the sugar content alone can cause issues your dog shouldn’t have to go through. Looking for some great, healthy alternatives for Thanksgiving foods your dogs can enjoy, or Halloween snacks your dogs can enjoy? Check out our respective posts for some great ideas. Your pet shouldn’t have to miss out on the celebrations entirely, so be sure to reward them with a few tasty treats that are actually good for them!